The new iMose Ankara K2 brings the power of the latest Android Kit Kat 4.4 OS to you in an affordable, rich and attractive package. It is simply the smartest and most affordable 3G phone available in the country. Many people will no longer lay excuses on cost for using an Android device anymore. Trusted Store, Cash on Delivery, Genuine Products BUY NOW! The iMose Ankara K2 shows off its super slim design which makes it fit into your palm nicely. Its cool slim body makes the device also fit comfortably into your pocket. The front surface of the Ankara K2 sports an awesome 3.5-inch capacitive touchscreen display with a resolution of 800 x 400 pixels (255ppi) and a Gravity Sensor support. It sports a 5MP back camera with LED Flashlight and a 0.3MP front camera which provides exciting pictures/graphics to make your experience beautiful. Thanks to its rugged Spreadtrum 7715 Processor, which should have a speed between 1GHz – 1.2GHz and backed by a RAM of 256MB with 2GB ROM which allows you browse multiple internet pages and utilize various apps at the same time with ease and speed. It comes with a built-in storage of just 2 GB which is not too small for the price of the phone, but can be expandable up to 32GB using MicroSD cards. The device is also powered by a battery of 1200mAh capacity which is needed to run the smartphone. Interestingly, for the price. The Ankara K2 comes in very attractive black color with a free Silicon Back Cover Case. Its comes preloaded with Whatsapp, BBM, Wechat, Instagram, Twitter and Facebook. It has an inbuilt digital calendar and clock which helps you stay on top of any appointments while FM Radio allows you to listen to your favorite radio channels anytime of the day. 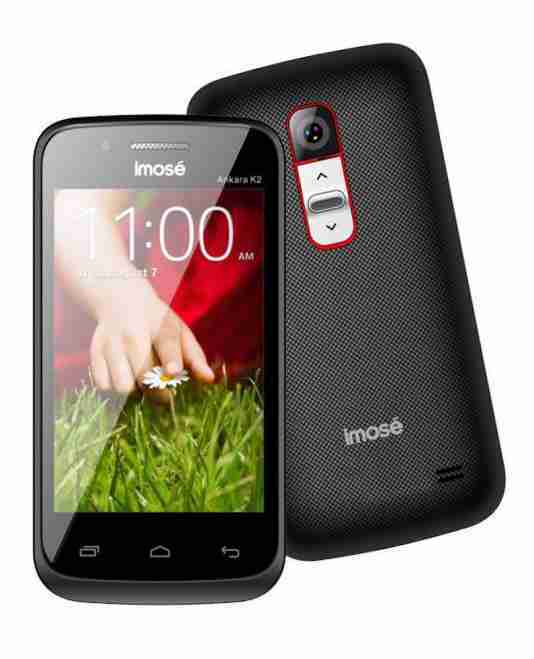 It gives support to 3G capability, MicroUSB 2.0, Bluetooth 4.0, DLNA and Wi-Fi 802.11 b/g/n are also among the connectivity features on the iMose Ankara K2. iMose Ankara K2 is now available in Nigeria.. You can now buy the iMose Ankara S1 at leading online stores in the Nigeria. iMose Ankara K2 Price in Nigeria starts at around N7,999.